The statistic illustrates the average weekly household expenditure on insurance products and lines in households where the reference person was at the minimum 50 years of age and older in the United Kingdom (UK) as of year end 2018. 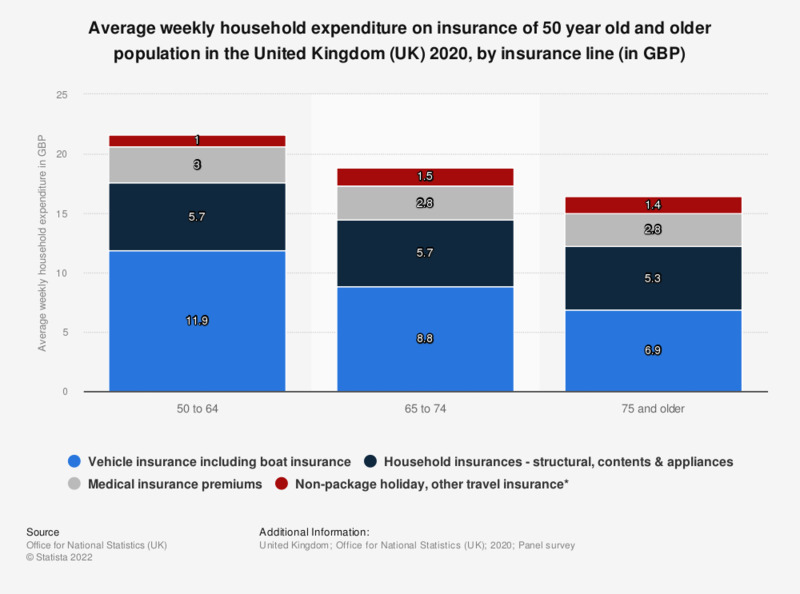 Respondents in the age group of 50 to 64 spent on average 5.3 British pounds weekly on household insurances (structural, contents and appliances) and an average of 12.4 British pounds on vehicle (including boat) insurances at that time. * Figures should be used with extra caution because they are based on fewer than 20 reporting households. In light of the number of travel company failures this year (e.g. low-cost-holidays), how important is it that your holiday is financially protected?